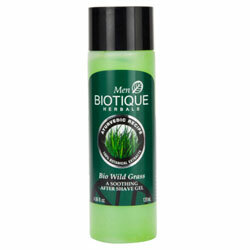 Anti-irritation After Shave Gel eliminate redness, burning & shave bumps. This anti-irritation after shave gel blends tender grasses, aloe vera, valentina and turmeric, to soothe, hydrate and safeguard skin after shaving. Helps eliminate redness, burning and “shave bumps.” Braces the face with a cool, refreshing feeling. Wild Grass is a joy of nature, sheltering the earth and energizing the senses for centuries. Breathe it in and feel refreshed and rejuvenated, day or evening. Apply to entire shaved area, immediately after shaving.